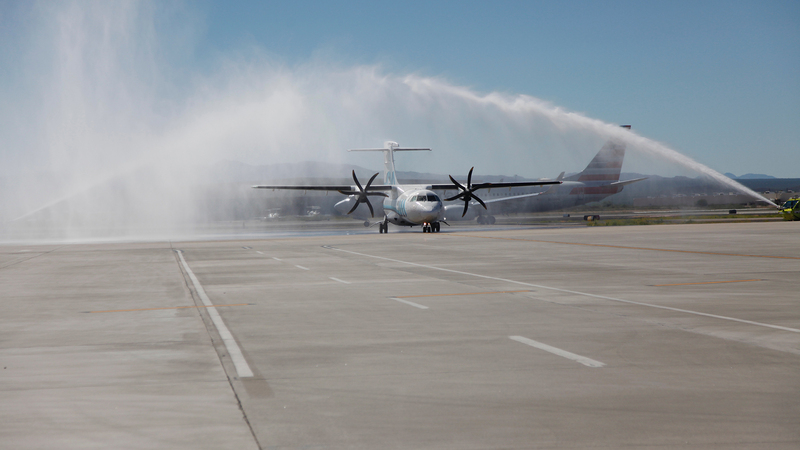 / Modified nov 20, 2017 3:55 p.m.
Fire crews at Tucson International Airport welcome the first arrival of a maiden flight at the airport. Tucson International Airport will soon begin nonstop service to and from Charlotte, North Carolina, on American Airlines. The flight will depart Tucson at 12:30 a.m. daily and land at 6:18 a.m.
Tucson Airport Authority officials tout the fact that the new route will allow passengers access to 73 east coast and international destinations that have morning departures out of Charlotte Douglas International Airport. The flight returning to Tucson will leave at 7:30 a.m. and arrive at 10:04 a.m. The new flight will take place aboard a 150-seat Airbus A320. MORE: Arizona, Business, Pima County, News, Transportation, Tucson, U.S.